Winning Design: it's not always black and white. The people's Choice winners have just been announced for the Design Museums "Designs of the Year" (see the Design Museum's full list here). These are some of my favourite colourful nominees from my visit to the exhibition. Made in L.A: Work by Colby Poster Printing Company. The contemporary graphics were curated & designed by Anthony Burrill and produced by the family run Colby company, who have continued to use woodblock, silkscreen and letterpress printing methods since 1946. Their pleasing no-frills style and energising colours continue to have an impact. These magical postcards are from Uniform. The prototypes include these cards and a special player. By slotting them into the gadget and squeezing the printed "buttons" the conductive ink controls a play, pause and skip track feature. Imagine combing these last two to create giant posters advertising bands, gigs and festivals where by being able to touch the special ink you could listen to their music! Here's a link to the BBC website where Peter Thomas from Uniform talks about doing just this, with their "Listening Post" idea. we're trying to recapture some of the tactile experience you got with vinyl records." Peter Thomas. This could work brilliantly well for the partially sighted, posters containing spoken information or conveying a message. Hands on again, but with Colour Porcelain! These exquisite pieces were hand painted by one the oldest Japanese porcelain manufacturers 1616 Arita. The simple modern design uses traditional Japanese colours, such as aquarelle blue, light green, red-orange and yellow ochre. 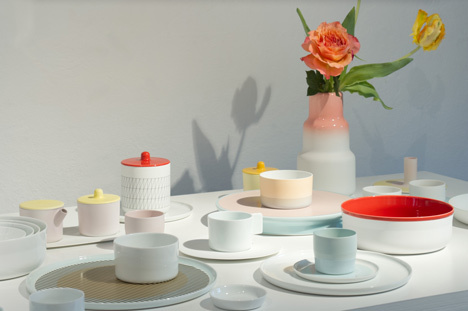 Designed by Scholten & Baijings Colour Porcelain consists of three collections named after their decoration: Minimal, Colourful and Extraordinary. In the Design Museum's exhibition the collection was displayed alongside images of the workshops where they were produced to communicate the craftsmanship behind them. I think if a lot of products were accompanied with an image of how they were made and who by it make make people consider where they are spending their money. Similar to cigarette packets showing health consequences, would you still buy that "bargain" with a photo of a sweatshop child peering at you? Or on the other hand would you be more likely to spend a bit more if you saw an established workshop stocked up with the finest quality materials?